1904; canvas, oil; Solomon R. Guggenheim Museum. Pablo Picasso’s painting “The Gladilshchitsa” is one of the most famous gems of his work not in vain. Compositionally simple, the work performed in restrained dull colors is filled with life and meaning, it makes the viewer feel, empathize, touch him to the depths of the soul. Most of the canvas is occupied by the figure of a girl leaning over a table on which freshly washed laundry is laid out. In the hands of the girl’s iron, she carefully smoothes every fold on the fabric and seems absorbed in her work entirely. The composition is so lively and natural that the smell of ironed clean fabric can be felt as if it were awake. Tension and imbalance are noticeable in the pose of the heroine. One shoulder is raised above the other, the head is tilted, the back is arched, the arms are tight. Obviously, this is how she spends more than one hour at work. She is still quite young and good-looking, but the constant hard work in a closed dark room dries up her youth and strength. At first glance, the uncomplicated composition acquires drama, it is worth imagining the further fate of the heroine. But at this moment her face looks almost serene, she seems to be awake while watching the movements of the iron. 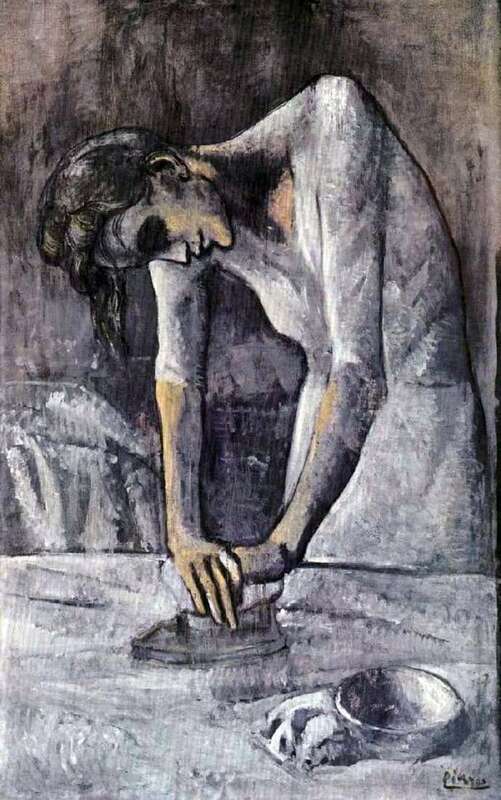 Her figure is illuminated with light: a white dress, slender working hands, a white canvas on the ironing table, glares of light on a metal bowl with water and an iron. The background picture is immersed in darkness, the details are smoothed and not clearly worked out. Behind the ironers, you can see a pile of white – probably underwear, which she will have to iron. The picture leaves the sensation of a light butterfly, locked in a stuffy cage, bent and enslaved by invisible chains.